Many moons ago, when I was sixteen, my school showed a film about Lourdes, the small French market town in the foothills of the Pyrenees, which has become one of the most important Marian pilgrimage sites in the world. I heard the story of Bernadette, who came from a poor, country background and at the age of fourteen was out gathering wood for the family when she had a vision of a beautiful lady who spoke to her, asking her to carry out certain tasks. I promised myself that I would visit Lourdes, but hadn't imagined such a long wait before I was able to fulfil my promise. My working life as a journalist kept me constantly busy, taking me to many countries, but never to France. However, I knew that it would happen. Now, in my retirement the opportunity to visit Lourdes was offered by my Parish of Our Lady of Grace and St Edwards. Like many of the churches in the Diocese of Westminster, it was organising a trip to Lourdes and was being led by Archbishop Vincent himself. As I had recently spent some time in hospital and found walking difficult, I had been assigned a wheel chair and a pusher, a 'red cap' as they were called. Her name is Naomi, a highly intelligent and caring sixteen year old, who wants to become a doctor. Surprisingly we found that we had a good deal in common, including a sense of humour. 'We're going to get on fine I thought' and we did. The crowded streets leading to the Sanctuary of Our Lady of Lourdes were a mixture of pavement eateries and shops selling brightly coloured rosary beads and crucifixes and statues of Our Lady. Definitely not the Lourdes I had come to see. But we were soon at the entrance to the Sanctuary, or as it's more commonly called, the Domain, with its order and peace. Small groups of nurses dressed in immaculate white uniforms, white stockings and white shoes, silently walked past. They tend to the sick and disabled who have come to Lourdes to bathe in the waters of the spring. that miraculously appeared after Bernadette had scratched the earth covering the dry rock. She did this at the request of the Beautiful Lady. The waters are still flowing to this day. I however did not immerse myself in the pool of water in the hope of being healed. I did wash my face with the water, but don't know if that counts! Young priests, their white collars open because of the heat, moved quickly about their business, while slightly older and more portly ones, moved gently across the green lawns. There were also a number of visitors, but everywhere there was silence. One lazy, sunny afternoon, Naomi and I were sightseeing, in the Domain, visiting some of the churches when we bumped into her Parish priest. Having visited Lourdes on a number of occasions and with no particular engagements, he offered to show us around. However, the heat of the sun soon forced us to find a shady place to sit . We were an unlikely group, a priest, a sixteen year old girl and myself. The conversation ranged over a number topics, but was largely about religion, each of us sharing our understanding of the message of the gospels. There was a warmth of feeling between the three of us that made it for me a very special occasion and this warmth stayed with me when we parted company and still does. Naomi and I headed for one of the bridges that cross the river dividing the town. We were soon joined by a few more 'Red Top' friends. As they were chatting and having fun we noticed a man walking alone on the other side of the bridge. He was casually dressed and at first we didn't realise that it was Cardinal Vincent. 'Can we ask him if we can take a photo' they said and without waiting for an answer they were at his side. Not only did Cardinal Vincent agree to be photographed, but he talked to the young photographers, and made some useful suggestions about the choice of background. It was a memorable meeting. What I took away from Lourdes, was not just a memory of the sacred grotto, or the beautiful masses we attended, or the candle lit procession , or the lovely people I met, but a wonderful feeling of well-being , a well-being which lies deep inside me. Trish with Cardinal Vincent and the Red-Caps! We are very much looking forward to having a brand new state-of-the-art sound system installed at Our lady of Grace & St Edwards this coming week, the 9th – 14th July, as our current sound system is no longer fit for purpose. This, inevitably, means that most of our weekday Masses during these dates will be without sound, and we extend our apologies for this. But, hopefully, from next weekend our new system will be delivering beyond expectation. With the Lent Project closing, the final cash grand total is £28,897! With Gift Aid of approximately £3,300 added through Bhola’s Children and The Cardinal’s Appeal that’s an undreamed-of total of £32,200! Of this £21,227cash is for Bhola’s Children and £5,000 is for the pews of St Martin de Porres’ Parish, Lukome, Uganda and £2,670 went to the Cardinal’s Lent Appeal. We were originally seeking £12,000 for Bhola and £4,000 for the pews. Most of the funds specifically for Bhola were correctly made payable to Bhola’s Children as a British Registered Charity, so Bhola has received most of its funds already with just the cash residue banked through the parish to be paid over, and indeed, news in from the charity is that work on the new roofs for the two classrooms we are funding is planned to be underway in the second half of June after Ramadan. The Trustees of Bhola’s Children are deeply grateful for our support as, doubtless, will the children be in due course, dry and safe under their new roofs. With St Martin de Porres Parish, Lukome, being in the Ugandan Archdiocese of Gulu, Fr Michael has been in contact with their Archdiocesan Finance Office for the transfer and disbursement of funds with the proper diocesan oversight and accountability. Remarkably, the diocesan Treasurer is a Comboni Missionary priest who spent some formation years in London and often visited the Comboni Missionary sisters in Chiswick Lane between 1961 and 1967! He has been in Uganda for 50 years. Meanwhile, Fr David the Parish Priest has also emailed full of gratitude and asking the Lord to bless the generosity of parishioners for giving his parish ‘such a helping hand’ and he sends his greetings to those he met here last July. The Archbishop of Gulu is scheduled at his parish to consecrate the church on 3rd November so we can hope the pews will also be in place by then too. Pictures will be sent on their completion. Thus, while there is no room for complacency, we have as a parish through our Lent Project helped others, improved lives, and partially breached, in the phrase of Pope Francis, ‘the globalisation of indifference’. As you browse through the parish website, you'll have already noticed that we have made some changes to its layout. These developments to the website are a 'work-in-progress', and our aim is to try to make the website, and the information we share, more accessible and easy to find. So, the first main change is where we publish the Parish News including, of course, our weekly Parish Newsletter. To access the news and the newsletter (including archived newsletters) click on the 'NEWS' tab at the top of the page, and select from the drop-down menu the tab 'Parish News', where you can find latest news and archived newsletters, or select the tab 'Newsletter' for the current issue of the Parish Newsletter. We have also begun to publish photographs of parish activities in our new 'Photo Gallery', which is located in the drop down list under the tab 'PARISH LIFE' in the menu at the top of the website. Enjoy your browsing! 30 September 2017: The only charming moment in the over-crowded and occasionally ill-tempered Chiswick Area Forum meeting last Tuesday evening at the Town Hall which was principally about TfL’s plans to drive Cycle Superhighway 9 unnecessarily through the heart of the Chiswick High Road communities, was when the Chair, former mayor Councilor Paul Lynch, recalled with joy the Mass celebrated in our church at the beginning of his mayoralty and his chatting afterwards outside with the late Cardinal Cormac. He then reflected, however, that, had CS9 already been built, he wouldn’t have been able to chat to the Cardinal outside church because he would have been standing in the cyclists’ right of way. This apparently innocuous remark highlights the real threat we face from TfL for our community’s future and why we have to do everything we can in this month of the consultation period. We need to highlight how unacceptable it is that the small public space we have needed outside the church to live our community identity for the last 165 years as the Chiswick Catholic parish, should not simply be snatched away from us. Even former parishioners have heard about this prospective trauma. One wrote to me: It grieves me to imagine that when my mother died we would have to dodgecyclists to take her coffin from the hearse into the church. Or when I got married and got out of my car in my wedding dress and had to be careful of cyclists. Not to mention gathering outside after Mass and have bikes whizzing past. Last Wednesday I had the privilege to officiate at the Requiem Mass of a 98 year old parishioner, Chiswick through and through, having been born on Duke Road. She too had worn her wedding dress on that pavement in front of the church when she married in 1945 but had to greet her husband at the altar of the church having climbed over rubble in the bomb-damaged open-roofed church! At least, however, she could ready herself on the pavement with her bridesmaids, and enter the church as she wished. Had she lived to her 100th, her coffin, under the current plans, could not have been carried with any right of way into church but we’d have been dodging cyclists. While clearly TfL do not intend us any ill, it’s nonetheless depressing to reflect that their state-sponsored, tax- payer-funded plans would do our community more harm by removing our capacity for a bridal procession, funeral procession and every other public expression of our Christian identity than the Luftwaffe managed with its wartime bombs. TfL’s own policy documents describe religion or belief as ‘protected characteristics’ which it declares it seeks to defend under the Equality Act 2010 but I see no evidence of this in their intentions. In fact, in spite of our community having an annual footfall of over 100,000 into and out of our church as we live our Christian identity, we were not once or in the slightest degree consulted before the plans were published about the impact of removing about two-thirds of the pavement we have happily shared with the public for 165 years and from which now, apparently, we can simply be brushed aside. Please help with the campaign to reroute CS9. There is more information elsewhere on the parish website and on our parish Facebook and Twitter. 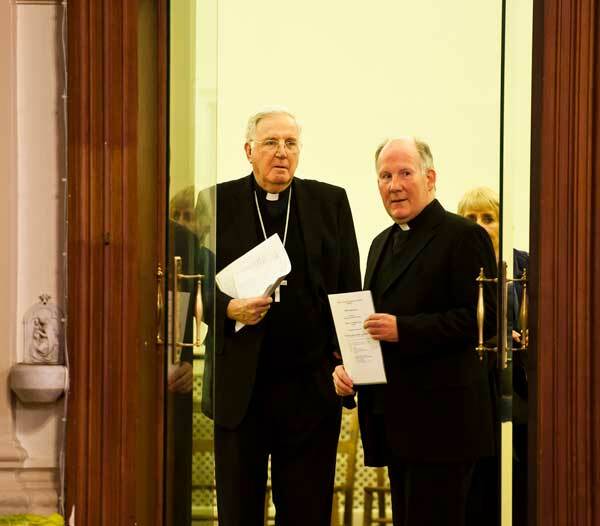 Click here to read how Pope Francis gave thanks for Cardinal Cormac's "distinguished service to the Church". 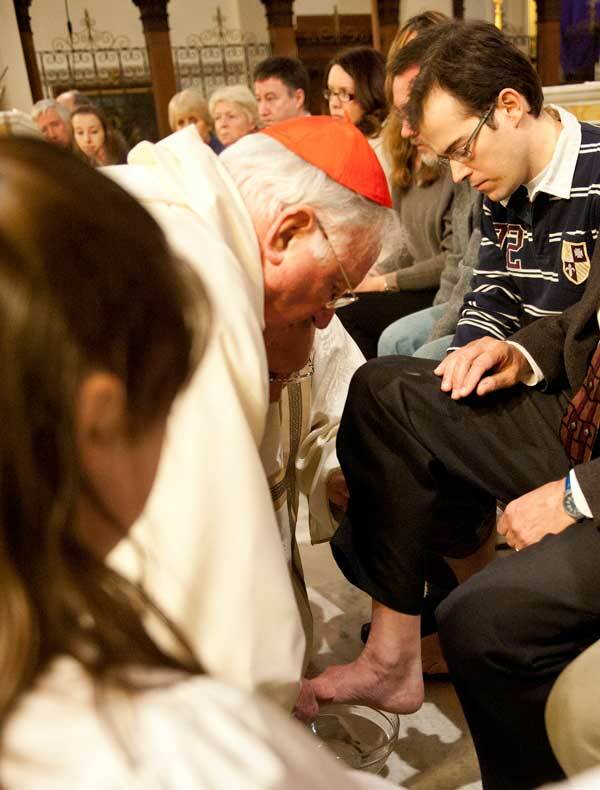 Click here to read the extraordinary note that Cardinal Cormac dictated to us as a parish, and which is being read at each Mass this weekend. It arrived on 31st August, the day before he died. 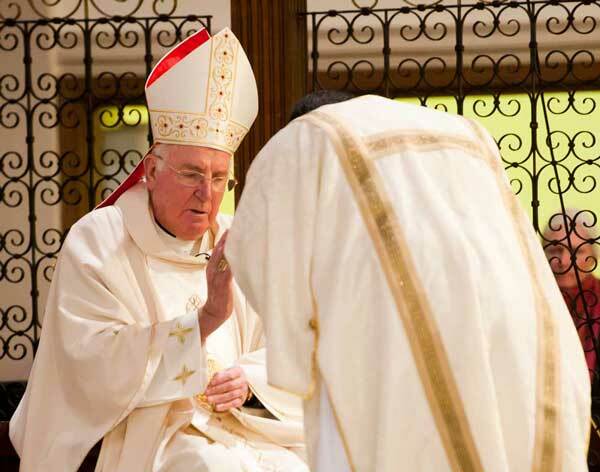 At 12.00noon the next day, Monday 11th September, Bishop Mark O’Toole will celebrate Mass for Cardinal Cormac, presiding and preaching as detailed before. After Mass, the Cardinal’s remains will be removed to Westminster Cathedral. On Tuesday 12th September, from 10.00am, the Cardinal’s body will lie in state at the Cathedral until 5.00pm where there will be Solemn Vespers with Cardinal Vincent presiding and Archbishop Longley preaching. The Cathedral will remain open until8.00pm. On Wednesday 13th September, at 12.00noon, the Cardinal’s funeral will take place. Cardinal Vincent will preside and Archbishop Stack will preach. Access is by ticket only. On Monday 14th August at 7.30pm in St. Edward's Room and also on Tuesday 15th August at 10.45am in The Parish Centre. Tea and Coffee will be served.